The City Council is expected to move swiftly on a bill to eventually double the number of food vendor permits. 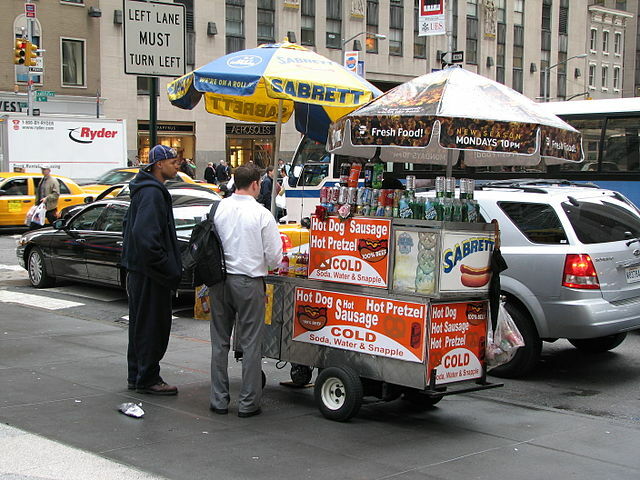 Before the package of bills known as the Street Vending Modernization Act passes, advocates want to ensure that it includes more safeguards to avoid obstructing crowded sidewalks. New York City capped the number of vendor permits at 4,235 in the 1980s. But many more people than that make a living by vending: There are currently more than 10,000 vendors operating throughout the city, most of whom are immigrants, according to the Street Vendor Project. The city sells vending permits that must be renewed every two years for $200, but the same two-year permits can fetch as much as $30,000 on the black market. The reform package, an initiative of Council Speaker Melissa Mark-Viverito, aims to phase in 4,445 more permits, lowering barriers to entry and reducing the threat of fines faced by the thousands of vendors who currently operate illegally. The legislation also includes revised guidelines about where food carts can set up shop. Carts should be placed within three feet of the curb on sidewalks and maintain at least 12 feet for pedestrian flow, for instance. Notably, the bill would reduce the required distance from a street corner, driveway, or subway entrance — from 10 feet to five. That could put the squeeze on pedestrians, especially on the city’s more crowded streets. In testimony submitted to the council Wednesday, TA Research and Policy Manager Julia Kite expressed general support for the legislation while recommending steps to ensure carts don’t conflict with pedestrian and cyclist movement. Among TA’s recommendations: Placing more food carts in the curb lane as part of an expanded DOT parklet program, which repurposes curb space for seating and other activities; designating areas that are already overflowing with pedestrians at peak hours as zones where new food carts won’t be placed; and including specific provisions to prevent the obstruction of bike lanes. We appreciate TA’s thoughtful stance, which recognizes that vendors are key stakeholders in a vibrant urban streetscape. Public spaces must be designed — which they have often not been — with vendors in mind. Restrictions on where vendors place their pushcarts, of which there are already many, must prioritize pedestrians while also taking into account that vendors are also sidewalk users whose safety is at risk from vehicular traffic. Vendors have been killed and injured by runaway vehicles. We desire inclusive public spaces that put people first, including people who operate their small businesses on the public thoroughfare, serving our communities and sustaining their families. The bill faces opposition from brick and mortar restaurant associations and Business Improvement Districts but is expected to clear the City Council. The de Blasio administration has declined to support the legislation in its current form, citing environmental concerns about emissions from vending carts. Maintaining the 10 feet distance is important, as is the attempt to move more vendors into the curb lane. The more crowded the sidewalk, the more likely peds will walk elsewhere, especially parking-protected bike lanes. Regarding the vendors themselves, their footprint on the sidewalk seems to have grown over the years, with some vendors placing umbrella stands and their chair apart from their cart. I hope this is better regulated when these new laws are passed. Vendor carts off curb with a bit of seating (street seats). Would be nice. Keeping carts in the curb lane would also eliminate the problem of getting carts on and off the sidewalk, which too often involves driving a truck or van through crowded pedestrian space. Why are you telling us to go on Facebook to see it, instead of explaining the “hidden agenda” right here on this site? This article incorrectly insinuates that the proposed 3-feet-from-the-curb rule is a tightening of restrictions. On the contrary, the current rule states that vendors must abut the curb. So this proposal would push carts further INTO the sidewalk, effectively narrowing all sidewalks by 3 feet. These carts should be in the curb lane, and every street should have a designated area where no curbside parking is allowed to accommodate that. There’s no denying food cart vendors are a necessary service providing meals to people who can’t afford the prices at brick and mortar establishments. However, that utility shouldn’t come at the expense of pedestrian space.